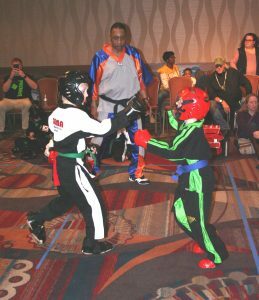 The sounds of clashing weapons, thud of rapid punches and kicks, and enthusiastic yells of martial artists took over the ballroom at the Crowne Plaza February 3. It wasn’t precisely gladiatorial combat, but rather the season opener of the Miami Valley Tournament Association (MVTA). The TAMA Tournament Team competed successfully in the MVTA season opener in Dayton, Ohio, bringing home 1st, 2nd, and 3rd place wins across multiple events and divisions. The TAMA Team is a karate team for kids and adults based in Kettering, Ohio, and hosted by TAMA Family Martial Arts. Ty Wetzel, Jasper Wetzel, James Pigg, Seth Brown, Greg Dinsmoor, and Samir Mamatov competed in the tournament. A new team member, Cooper Duckro, showed up to cheer us on. They brought in a total of 8 First Places, 2 Second Place, and 2 Third place awards. 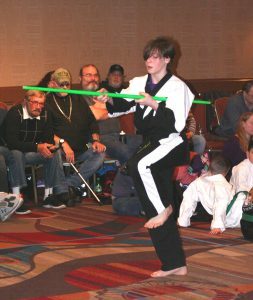 MVTA tournaments consist of at least three events: fighting, weapons forms, and empty hand forms. 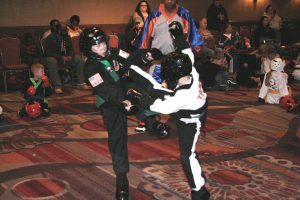 Fighting is conducted via point sparring – a safe way to demonstrate a fighting technique while preventing injury. Forms (also called Kata) are prescribed series of movements demonstrate complex combinations, focus, and intensity. Grandmaster Manuel Taningco is one of the directors of the MVTA, and our school (TAMA Family Martial Arts) has supported the series for more than 20 years. The team has practice sessions focused on the competition once or twice a week, in addition to the multiple daily classes offered at TAMA. Practices might consist of supervised drills to refine technique, watching a video recording of the performance to understand where to improve, or just friendly competition within the school. The karate team has both kids and adults attend regular practices at our school in Kettering. Joining the karate team gives students the opportunity to learn from more experienced competitors and to help each other get better. Team practices focus on successful competition strategies and make sure you have the tools you need to represent yourself and your school. There is also a strong TAMA booster organization that manages fundraisers such as candy sales and date nights to help team members defray the costs of competition. If you’re interested in learning more about the team, please contact TAMA Family Martial Arts at (937) 254-7035. 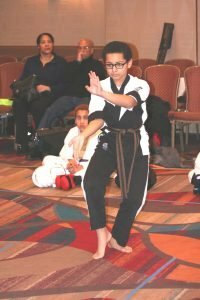 The TAMA tournament karate team is an organization for all ages to represent our school at tournaments and community events. There are typically 8-10 tournaments per year, along with parades and other special demonstrations. Most of the tournament activities will be through the Miami Valley Tournament Association and be conveniently located in our community.